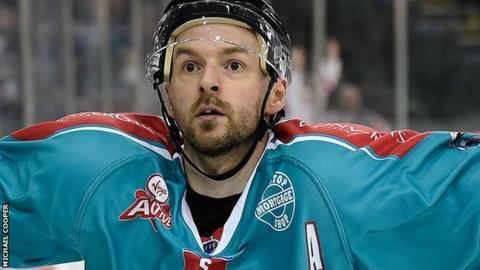 The Belfast Giants completed a dismal weekend by losing in a shootout to the Elite League's bottom side Dundee. It follows Saturday's home loss to the Hull Stingrays and is a setback to Belfast's hopes of retaining the title. The Giants trailed to a Chris Blight goal in the first period at Dundee but led through scores by Colin Shields and Kevin Westgarth. John Dolan equalised, and with no scoring in the third period or overtime, the match went to penalties. The Giants had the early advantage in the shootout as Mike Kompon scored and Carsen Chubak saved from Blight. But Robby Sandrock and Shields were thwarted by home keeper Marc Cheverie and scores by Sean Ringrose and Dolan won it for Dundee who had been hammered 9-3 the last time the sides met in December. Elsewhere on Sunday night, leaders Braehead won 4-1 in Hull, Nottingham were 4-3 overtime winners over Cardiff, Fife hammered Edinburgh 9-3 and Sheffield won 3-2 away to Coventry.